Brackley Community First Responders is made up of a group of volunteers who have been trained by East Midlands Ambulance Service NHS Trust (EMAS) to provide emergency medical aid to people living and working in the local community. The purpose of a Community First Responder Group is to provide emergency medical care until the professional service arrives on scene. If you would like to find out more about how you can support Brackley Community First Responders or if you are able to offer sponsorship, please use the contact us link. Every Minute delay reduces the chance of survival. In a CFR’s case the control room will despatch them to an emergency call within their area. At the same time an Ambulance will also be dispatched. Whilst the larger vehicle and crew are still on their way, CFR’s have usually completed the essential patient assessment and began treatment. Once the crew arrive, the professionals will then take charge and transport the patient to hospital if needed. 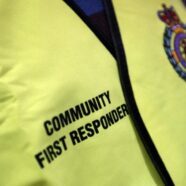 Community First Responder Schemes ensure that local people are trained in simple and safe techniques that can be used to save lives. These techniques are rarely associated with causing harm and in true life and death situations, there is often little harm that can be done compared to doing nothing at all. Views that are express here are Brackley Community First Responders and do not necessarily reflect the views of East Midlands Ambulance Service NHS Trust.